The first day of the Chinese lunar calendar has been a time to honour ancestors and various deities around family gatherings for hundreds of years. Festivals often run until the 15th of the first month as celebrants try to sweep away the ill fortune that has plagued their houses for the previous year and usher in waves of good luck. Now that kind of devotion to merrymaking and the bringing of good luck deserves a mobile slots game and Play’n Go is the software maker that has delivered it. 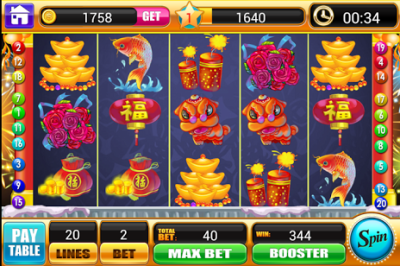 Chinese New Year is a five reel slots game with 15 win lines. You can start the fireworks with merely 0.01 coins and bet up to 0.25 coins per line. There is no progressive jackpot but the party is drawn out by free spins and multipliers. Chinese New Year brings all 12 animals of the Chinese zodiac to the celebration – rat, ox, tiger, rabbit, dragon, snake, horse, sheep, monkey, rooster, dog, and pig. All are pleasingly hand drawn and each has a role to play, either in bringing prizes or orchestrating bonus games. The Tiger is the Wild symbol in Chinese New Year, imbued with the power to stand in for other symbols and help create winning combinations. While it is rare for Tigers to hunt in packs if five appear on the prowl on a single payline the return is a handsome 5,000X your original stake. The Monkey only inhabits the first three reels but if it shows up in the proper sequence it opens a new screen with a spinning wheel of nine animal symbols. The Monkey will then spin the wheel to identify the animal that will act as an extra scatter during an upcoming free spin session. How many? The Monkey will let you know. The new Scatter will also expand to make entire reels wild when three or more show up during bonus play. The Dragon controls the Pick Me Bonus in Chinese New Year. it operates only on the last three reels. When the Pick Me Bonus is triggered you are transported to a river barge operating fireworks over the city in a night time celebration. Each one you fire off leaves a residue of a multiplier and in theory you can win 150X your total bet. Xin nian kuai le!